The accumulation of abscisic acid (ABA) and the activities of antioxidative enzymes along with cell metabolic activity were monitored during androgenesis induction in triticale (×Triticosecale Wittm.). Tested cultivars ‘Mieszko’ and ‘Wanad’ were selected due to their significantly different responses to androgenic induction. 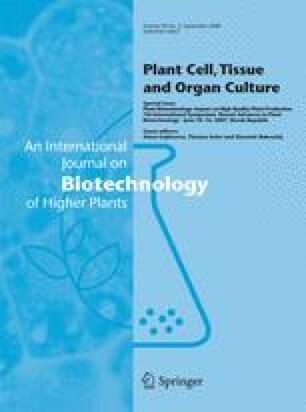 Significant variation was observed in respect of superoxide dismutase activity and endogenous ABA content in anthers isolated from freshly cut tillers. For both cultivars, tillers pretreatment with low temperature decreased peroxidase activity by 36%, highly accelerated respiration rate and reduced heat production. At the same time, the level of ABA in ‘Mieszko’ was increased to the level measured in ‘Wanad’. This effect was associated with higher microspore culture viability and increased stress tolerance in ‘Mieszko’. Low temperature and metabolic starvation during 4-day anther preculture did not influence activities of antioxidative enzymes, while it resulted in slight decrease in respiration rate and heat emission. The importance of these changes for effective androgenesis induction is discussed. The research was supported by the project KBN23/E189/SPB/COST/P06/Dz585/2002-2005.